This is just a tease for a project that will run through April, which is National Poetry Month. How does one get ARK? ARK, my new book of poetry just published by Sibling Rivalry Press is available in Columbia, SC at the Columbia Museum of Art Shop. But, if that’s not convenient, then you can order it directly from the publisher. Format ImagePosted on March 18, 2016 Categories PoetryLeave a comment on How does one get ARK? This Sunday, March 13 at 3pm at the Columbia Museum of Art, there will be a launch event for my new book of poetry titled Ark. Ark is about a son’s return home, a father’s death from cancer, and the gifts of healing found in the care of the dying. Where is Your Next Stop? Launching Poets on The Comet This Sunday, November 1! 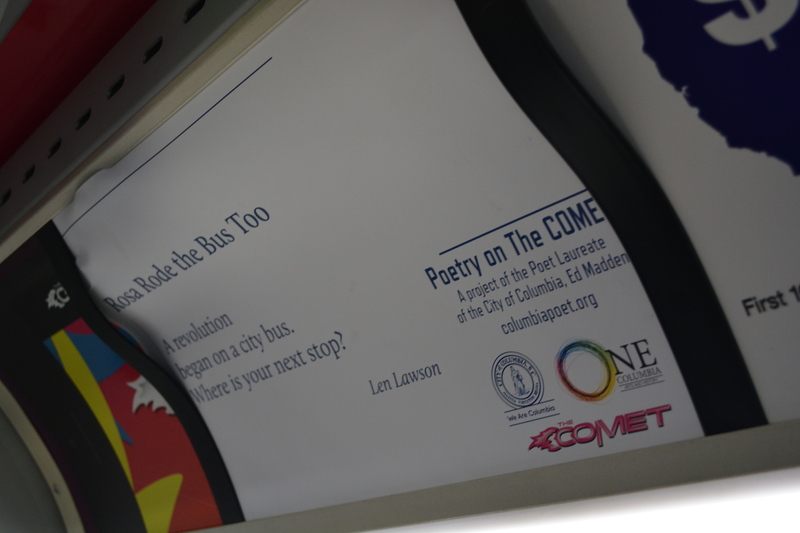 On Sunday, November 1, One Columbia and The Comet will host the launch of our city’s first major poetry as a public art program—poems on city buses—with a rolling poetry reading on a downtown bus route followed by a celebration and reading at Tapp’s Art Center (1644 Main). Repost from The Jasper Blog. Format LinkPosted on October 30, 2015 October 30, 2015 Categories News, Poetry, Public Art, Reading1 Comment on Where is Your Next Stop? 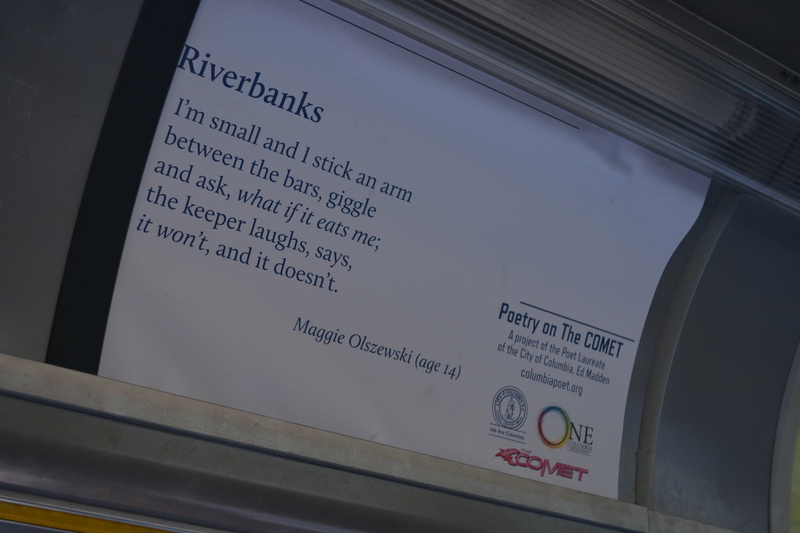 Launching Poets on The Comet This Sunday, November 1! To celebrate this project, there will be an event titled “Poetry 101” held on November 1. 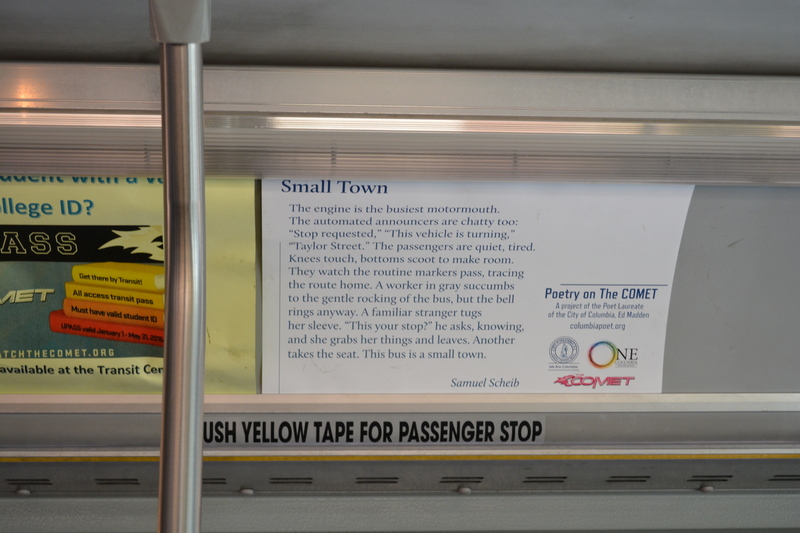 A number of poets will be reading on COMET Route 101 North Main, rotating at select stops. After the rolling reading, the event will proceed at the Tapp’s Arts Center (1644 Main), where there will be light refreshments, and a poetry reading. Anyone who would like to ride along with the poets should report at the Sumter Street Transit Center (1780 Sumter) at 3:30pm. Limited seating, first come, first served. One Columbia has also collected poems into a chapbook which will be free and available at the event on November 1 or at the One Columbia office (1219 Taylor Street). As an added bonus, all rides on Route 101 North Main will be free to any riders all day on November 1! A reading of the poem “When we’re told we’ll never understand” from “Hercules and the Wagoner: Reflections, South Carolina, June 17-22, 2015.” This poem was written in response to the tragedy at Mother Emmanuel AME Church in Charleston, SC and in conjunction with the efforts to remove the Confederate flag from the SC Statehouse grounds. 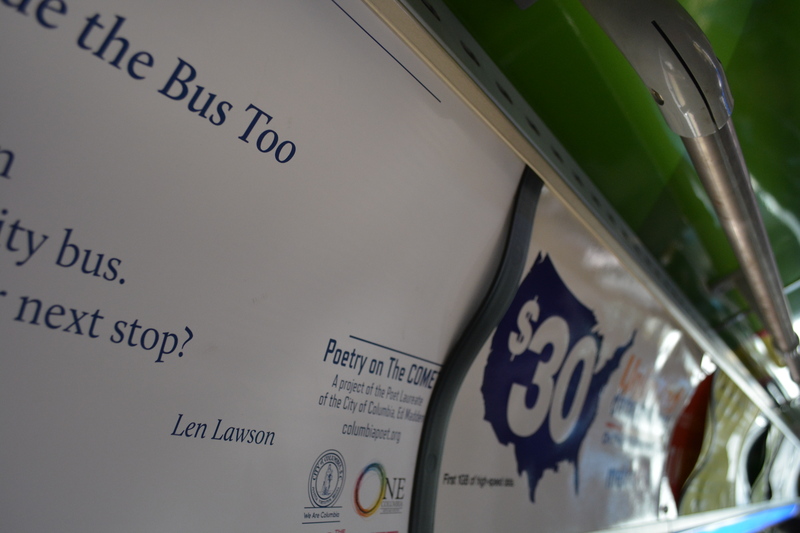 The poem was originally read as part of the Take It Down rally at the Statehouse on June 20, 2015 and reprinted in both the Free Times and The State Newspaper. “A New Day Dawns” written and read by poet Nikki Finney.